PETER PAN has 2 services, an open bar, a large central table and a room for about fifteen people. It also has an upper deck for relaxing and sunbathing. 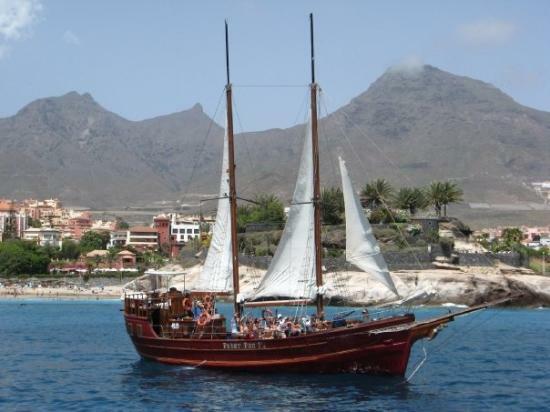 The PETER PAN is based in the town of Los Cristianos, from where we will start the trip to visit colonies of pilot whales and dolphins. Anchor later in the marine reserve of La Caleta and the Palm-Mar to enjoy a swim in its clear Waters and amazing lunch. Lunch on board is included into the tour price: Paella, Chicken, salads, bread and fruits. Drinks on board are included into the proce: Water, soft drinks, sangria wine and beer. Whale & Dolphin Watching boat trips by PETER PAN Ship starts from Los Cristianos every day at approx. 10:00 AM and 01:30 PM (depend on Pick Up point) and the boat stuff speak a few languages. 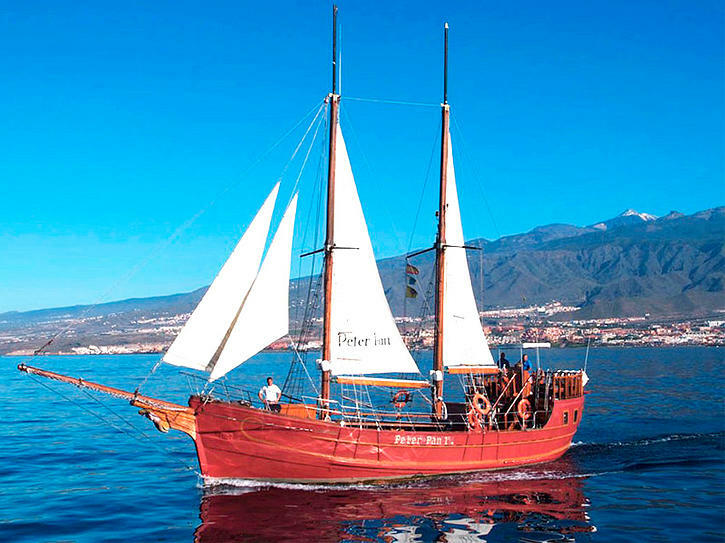 In order to make your booking of PETER PAN Ship Boat Trips, Private Charters easy and comfortable Tenerife Host use the most advanced and user friendly booking platform TripsPoint.com where you can easily check last actual prices, the tour availability, required booking deposit and book this tour. To get more information of PETER PAN Ship Boat Trips, Private Charters and do booking, please, click the button ‘Book Now’. You will be taken to the tour page at TripsPoint.com where you can easily book the tour. Once the booking of XPETER PAN Ship Boat Trips, Private Charters made at TripsPoint you will get your tour Voucher / booking confirmation with all details, including exact pick-up point, pick-up time and map. 19,50€ – per child up to 11 years old. The price include bus transfer to the harbour, 3 hours sea trip, Whales & Dolphins watching, lunch, soft drinks and alcohol. min. 3 hours, max. your group size is 54 people. The price include transfer to the ship, sea trip, Whales & Dolphins watching, lunch or dinner, soft drinks and alcohol.